I have been traveling quite a bit this summer, hence the three weeks of quiet on the blog. On one of my trips to the Midwest, I stopped at my parents’ house to visit for a few days. Before arriving, I mentioned to my mother that I wanted to go through our family pictures and perhaps take some back with me. I had a vision of creating a family picture wall in our dining room, collage-style, and wanted to include some of my childhood pictures. One afternoon, my mother and I headed down to the basement to fish out the pictures I had requested. Upon reaching the large storage room filled with holiday decorations, folding chairs, coolers, old clothes, and yes, family pictures, I was distracted by several boxes of items from my Grandma and Grandpa Lauritzen. I began going through the boxes and unearthing treasures from my family’s past, childhood memories flooding over me. My grandparents lived in a big, happy family house about twenty minutes from where I grew up. We spent most holidays there, the house filled with cousins, laughter, and lots of fantastic food. My grandparents’ house served as the family meeting spot, and my grandmother was a well-prepared hostess. One thing she always had on hand was a dish filled with candy. I have vivid memories of going to my grandparents house and helping myself to a treat, always displayed in a beautiful dish. My grandmother had a never-ending rotation of candy dishes sitting out in her house, I assume just in case one of her grandkids happened to stop by looking for a treat. Finding her candy dishes was a little bit of a treasure hunt, as I don’t think she ever kept them in the same spot. They weren’t difficult to find, just cleverly moved around to keep it interesting for us. Going through the boxes in my parents’ basement, I unearthed two of my grandmother’s candy dishes: a footed glass bowl and a hand-painted piece made of china. I carefully wrapped them in layers of t-shirts and cotton shorts and carried them back to the West Coast in my suitcase. I’m happy to report that they both survived, not a scratch or chip on either one of them. 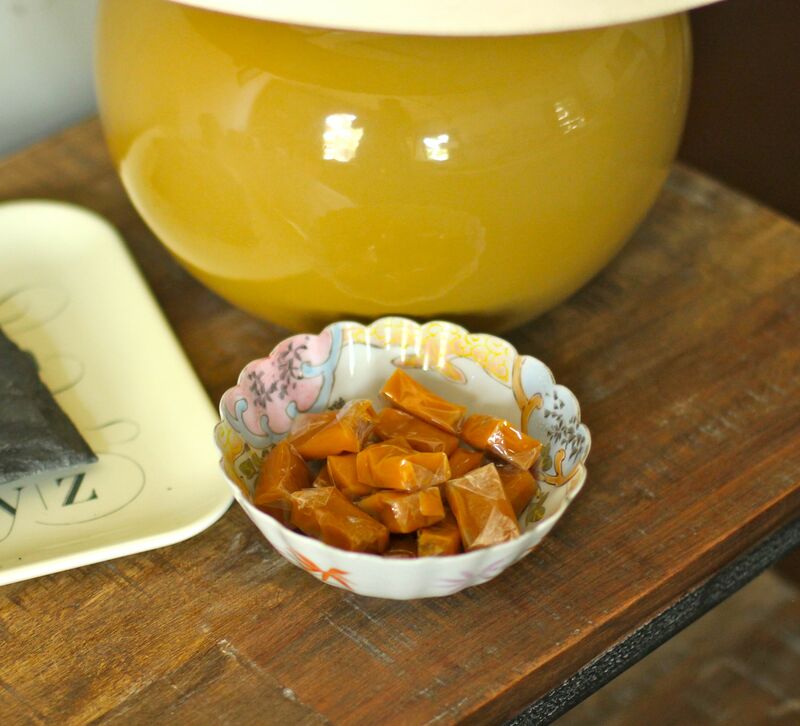 Now that they’re completed their journey, I’ve decided to resurrect the candy dish in my own home, in hopes that guests visiting the bungalow will remember that there is always something sweet here, a treat waiting to be discovered and enjoyed. The glass bowl in the first photo balances on three little feet, giving it a tiny lift that makes it feel just a touch on the fancier side. 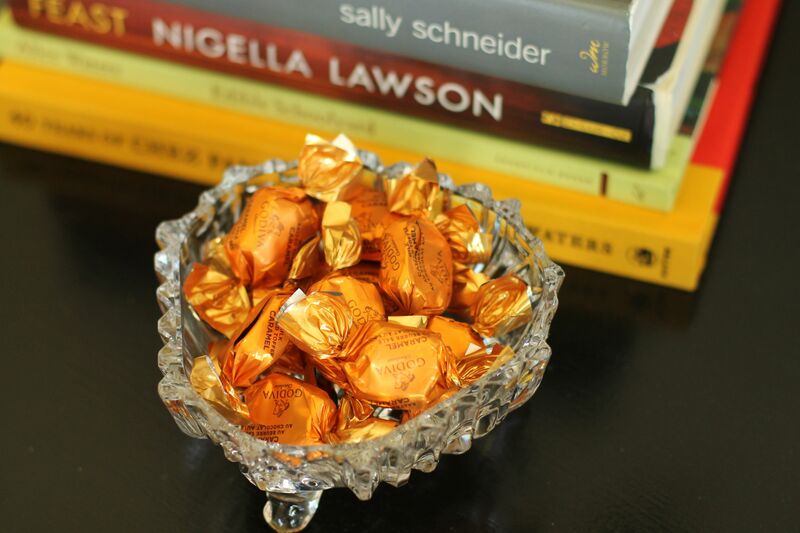 My grandmother used to keep Werther’s candies in that dish, and we would open the gold wrappers and pop buttery candies into our mouths, daring each other not to bite through the hard toffee. In adulthood, I confess I’m not longer as big of a fan of Werther’s candies, perhaps because I ate so many of them as a kid. Instead, I’ve filled this dish with Godiva salted caramel chocolates, a special treat indeed! Below is a photo of the second bowl, with pastel colors that feel summery; I love the scalloped edges. I filled this dish with salted caramels as well…notice a trend here?! Here are two dishes of my own that I’ve turned into candy dishes. The yellow footed dish was a flea market find, the warm amber color being a favorite of mine. I have an affinity for footed dishes and platters, and simply could not pass this one up. The second dish is actually from Ikea. I love the texture on the outside, and the way the color barely conceals the contents, teasing you to lift the lid to see what’s inside. Peanut M&M’s and Hershey’s Kisses are two of my favorite treats, and I look forward to sharing them with anyone who comes to visit the bungalow.